In our age of technology, many are used to streaming videos, music, and other content. Amazon has been selling eBooks for its Kindle devices for many years. Folks like the convenience of content being delivered to their electronic devices; however, there are some drawbacks. I have mentioned some of these before but two more examples have surfaced lately that are worth noting. If you have ever bought a Blu-ray or DVD movie, you often will see a sticker on the box that says free digital copy included. OK, so what happens when the digital copy company goes away? 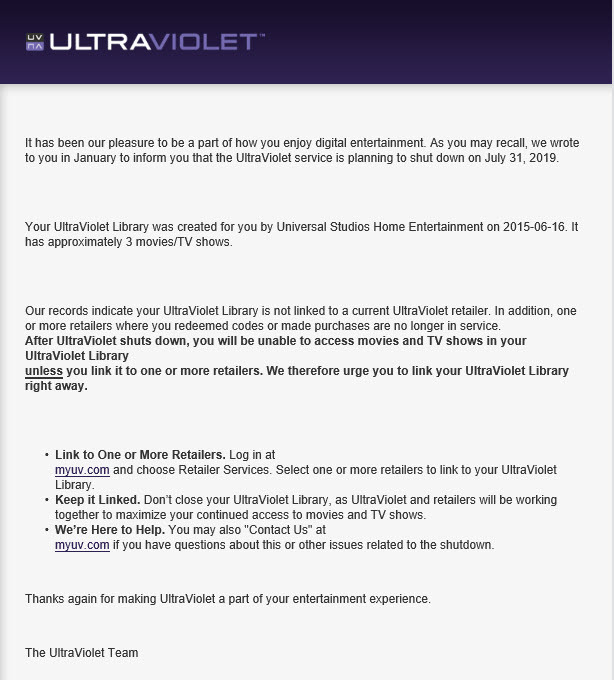 The go to service for many years has been UltraViolet but UltraViolet is going away in July. So you can either transfer your digital content to one of three other providers or let your library expire. Since the physical disks have DRAM encryption on them, you can’t just rip your own copy to your computer. If this is true of physical media with a digital counterpart, what about people that purchased a digital only copy of something? What happens when your eBook company draws its last breath or decides to get out of the business? Enter exhibit number two, Microsoft. It will come as little surprise to our readers that Microsoft is exiting another consumer market. More worrying is the second bit, however. Presumably, due to some DRM scheme, Microsoft will be remotely deactivating books readers already purchased and downloaded. Microsoft says they will be giving full refunds, and if you used Microsoft’s much-touted inking feature to make notes, Microsoft will still be burning your book, but will give you a $25 store credit. So just like that, the “velvet sweatshop” as its employees call Microsoft, just clicks a button and kills all you digital content. What if Apple or Amazon decides to kill your music library or eBooks? So next time you think I’m old fashioned because I actually prefer physical media, at least I own what I paid for.